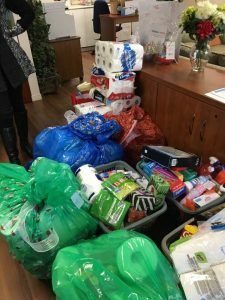 I would like to send out a very big thank you to all of you who contributed to my charitable efforts to support Home Suite Hope’s Holiday Gift Drive this past holiday season. 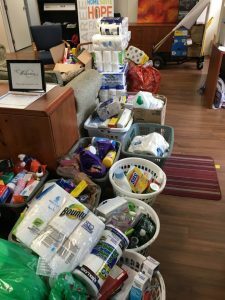 Collectively, we were able to provide laundry baskets full of household products to 16 of our lone mother students; 15 of whom are part of the Home Suite Hope program. In addition to this, we collectively donated $1245 in gift cards to the families and provided gifts for two complete families, including the mothers and their children (2 teenagers in one family and 3 in the other). We purposely chose the families with teens, as they are the least likely to receive donations from other sources. 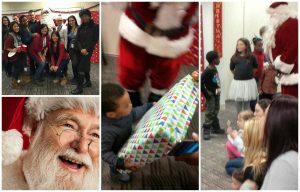 See the photos above of our collections, and your generosity, and below, of Home Suite Hope’s holiday get together – their Hope for Holidays. 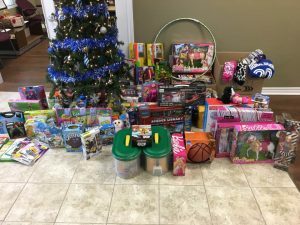 In addition to all your gift-giving for Home Suite Hope, we were also able to provide a significant amount of gifts to my second charity, PayItForward. Thank you, again, to all of you, and a special thank you to Paul Angelini, Owen Percy and Robyn Read, Janet Shuh and Jessica Pulis who provided a significant portion of the contributions.